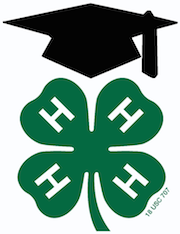 Nevada County 4-H Council Scholarship Opportunity for High School Seniors! The Nevada County 4-H Council Scholarship is open to current Nevada County 4-H members only. The applicants must be members in good standing of Nevada County 4-H for a minimum of 2 years prior to application year. They must be accepted into a higher education school for the same year of the scholarship application year. (Apply in June for scholarship, go to school in fall of same year) This would include University, Community College or Trade school. The application will consist of (no more than) a 2-page letter outlining the student’s 1) 4-H involvement, 2) educational goals, and 3) community service. The letter must be written by and hand signed by the applicant, AND hand signed by both his/her current 4-H Community Leader and a current 4-H project leader. Scholarship application letters must be submitted to the 4-H office no later than the close of business hours on June 30th (end of program year). Electronic applications will not be valid, because of the hand-signed requirements. They must be mailed or delivered to the 4-H office. The Nevada County 4-H I&R committee will review all applications and select the recipients of the two to four awards, from $500 to $1,000, for a total of $2,000 per year, awarded at the discretion of the committee. The awards will not be released until Achievement Night. Students will provide proof of GPA at time of application and proof of enrollment to receive their awards.